Dimensions (HxWxD): 4.65" x 1.75" x 1.45"
This AAA quality Golden Healer Lemurian Twin Isis Window Pane Wand is a natural, unpolished, color saturated 4.65 inch long crystal, weighing 184 grams or 6.4 oz., more than one-third of a pound. 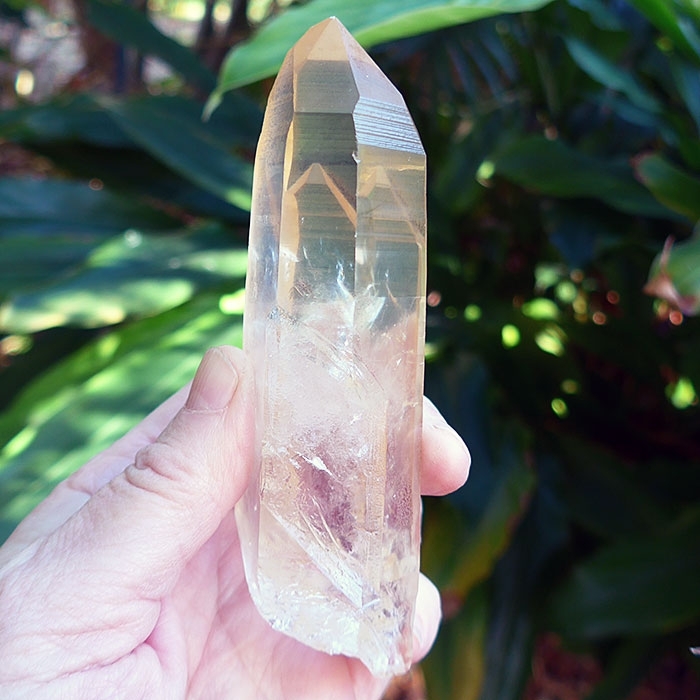 This Golden Healer Lemurian Twin crystal is AAA quality because it exhibits gorgeous coloration, a flawless, unblemished surface with termination tips free of dings, a perfectly formed pentagonal Isis face opposed by a triangular face, a growth interference groove, prominent striations, and a distinctive, perfectly formed window on one face where the shaft meets the termination tip. 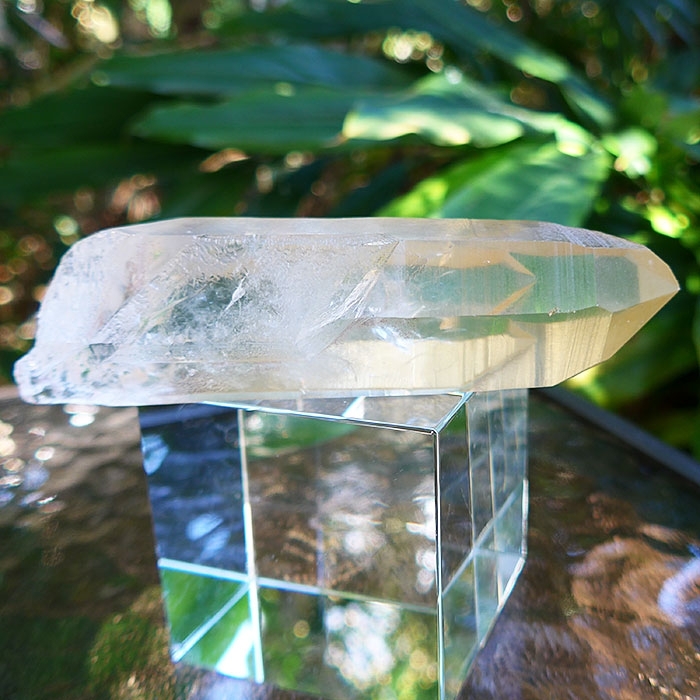 This crystal has resided in Jane and Curtis' private collection, on our meditation altar, for about ten years, but the time has come for this magical stone to seek a new home. 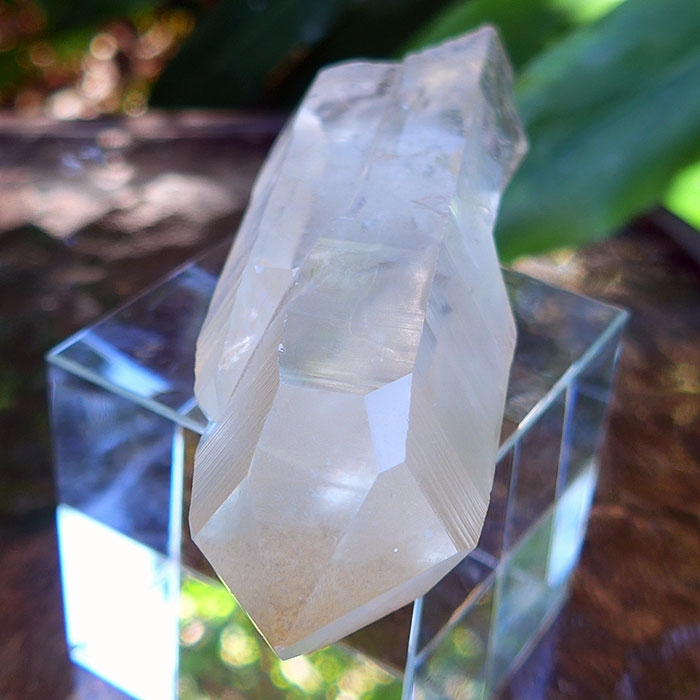 This remarkable specimen comes from one of the new Lemurian mines in the Serra do Cabral mountain range in Brazil. It is the perfect size to hold comfortably in the hand during meditation or energy treatments. 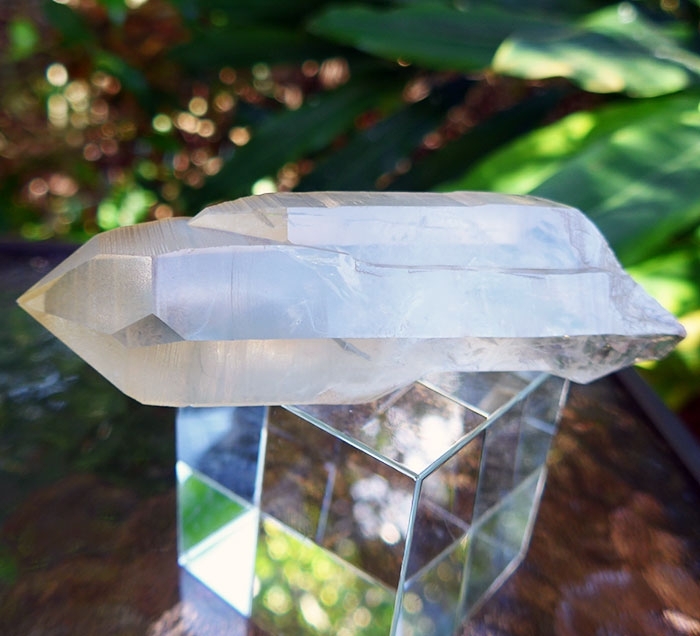 Read more about the mineralogical and metaphysical properties of Lemurian crystals of various types in our new online book Spirits of Stone. 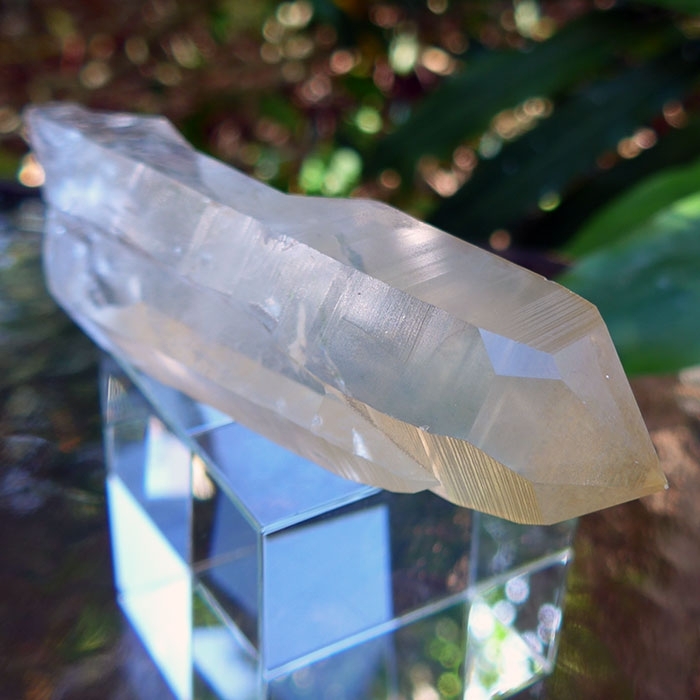 Read Chapter Two & learn about the history & use of Lemurian Seed Crystals. See new photos from the Lemurian mines of the Serra do Cabral and a map of the mines. Isis crystals like this one have one or more pentagonal or five sided faces opposed by three sided faces. Isis crystals can assist us in connecting with the Divine Mother. Isis was known as the Egyptian Queen of Magic and Giver of Life. For both men & women, such a crystal can help to balance the male and female aspects of our beings. Isis crystals assist us to connect with the qualities of the Divine Mother: nurturing, strength, self love, Universal Love and compassion. 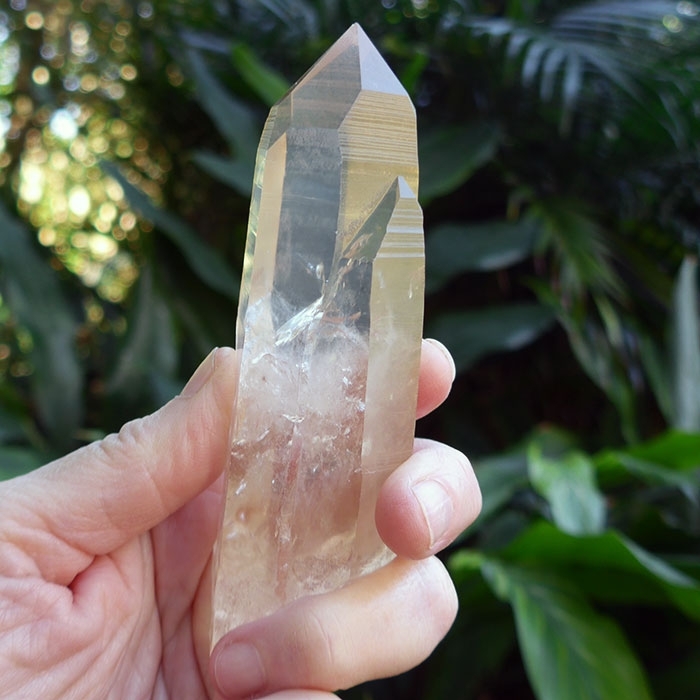 Isis crystals can help to foster the native intelligence we all have, called Intuition. Window quartz is so called when there is a diamond, rectangular or four sided face between the tip facet & the body. These forms are said to be a 'window' to the soul, to help one access the intuition without the interfering mind, ego or emotions. It is helpful using a ‘past facing window’ (one which points to the left), to access information which may be helpful on your current journey, or something which must be retrieved in order to be completed or to gain closure & understanding. A forward facing window is one which angles to the right and can be used to access information similarly from the future. 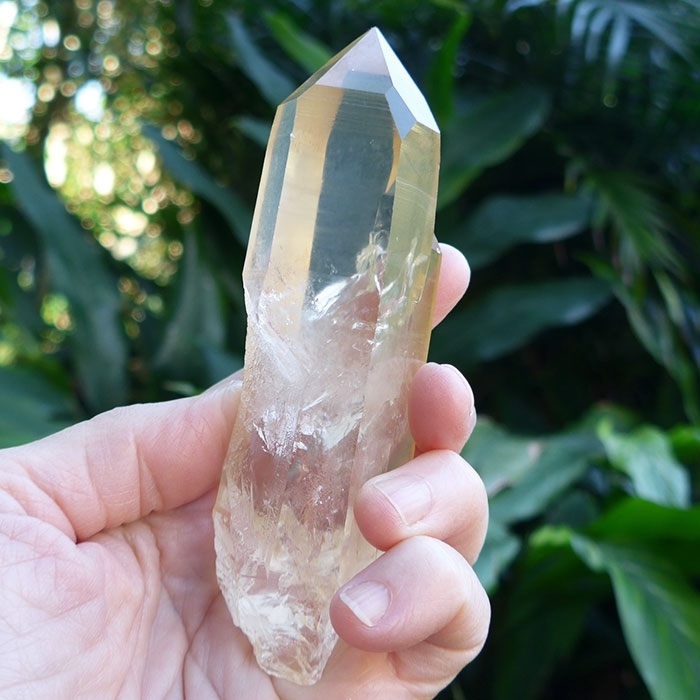 Because these Golden Lemurians are so saturated with both light and color, they look deeper and more transparent depending on how you hold them and in what kind of light you are working in with the wands. Next there is a sense of energy elevating to a higher frequency within all seven of the primary chakras associated with the physical body. 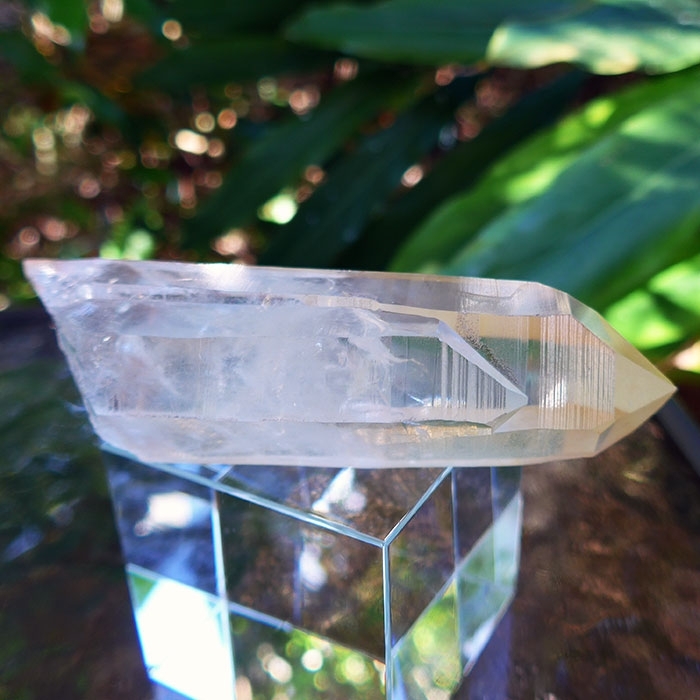 Other golden crystals and gemstones we have used amplify the energy in the crown chakra, but these Lemurian golden healers are true "ascension stones", raising the vibrational frequency of the entire chakra system and promoting a higher energy signature throughout body, mind and aura. 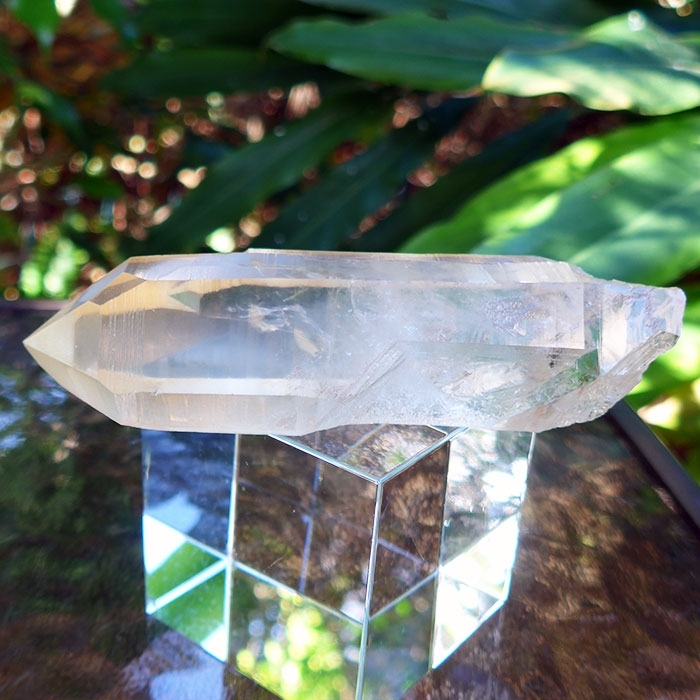 These golden healer crystals promote the purification of the entire body, mind and aura as they simultaneously help the bearer to raise their energy from the lower chakras to the more highly evolved spiritual centers. 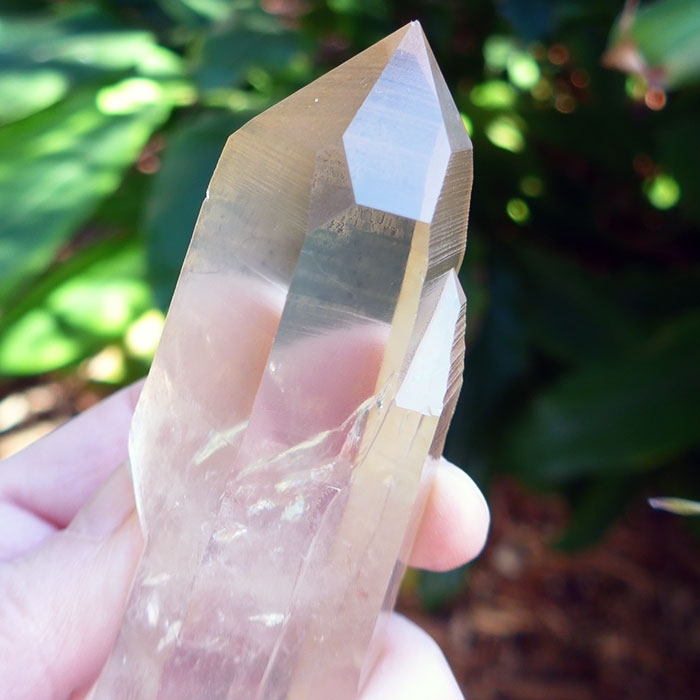 No matter where your consciousness is normally centered, in the first, second, third or fourth chakra, you will notice that your consciousness is raised to a higher level during sessions with the Golden Healer Lemurian crystals. Note: weight above is shipping weight. Net weight is 184 grams, .4 lb., or 6.4 ounces.